Microsoft has announced new AI features in Word that will track unfinished notes in a document and turn into to-do lists. The feature is currently available on Mac for Office Insiders (Fast level) as a preview and it will be rolling out to all ‘Office 365 subscribers’ in the coming weeks. 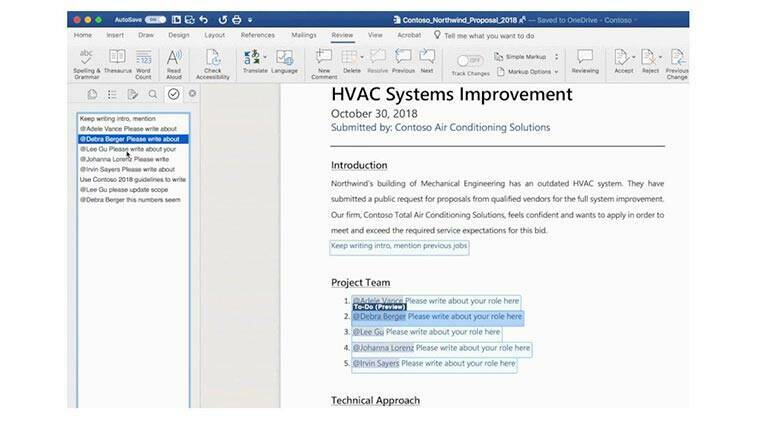 The to-do lists feature which is a part of Editor, Word’s AI-powered writing assistant will help users to pick off in a Word document where they left and even allow inviting others to collaborate. Microsoft notes that while many Word users leave a placeholder in their document to ‘mark an area’ so that they can return later and stay in “flow,” this AI-based tool will help them work without breaking the flow by creating to-do lists automatically and filling these placeholders. Microsoft explains that if you type “TODO” or “<<insert closing here>>” in a Word document, Editor will recognise, track them and each as a to-do list. Once you return to the Word document you will see the “remaining” to-do list and clicking on a to-do item will directly navigate you to the right placeholder within the document. In case you are working on a shared Word document and need help, you can simply type @mention followed by the name within the placeholder and they will be notified about the item with a “deep link.” The tagged person can take ‘action’ by replying to the email. Microsoft in its blog post notes that in the next few months Word will utilise Microsoft Search to suggest content for a to-do item. For instance, if you select a suggestion “<<insert chart of quarterly sales figures>>” you will be able to look for appropriate content from other documents and insert relevant information within your document.